To say Giacomo was a surprise winner of the Kentucky Derby would be an understatement since he generated a $102.60 win pay-off, the second largest ever in Derby history. 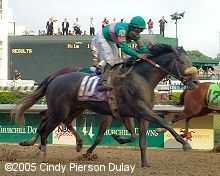 He was a vindication for his sire, Holy Bull, who disappointed as the favorite in the 1994 Derby and finished 12th. 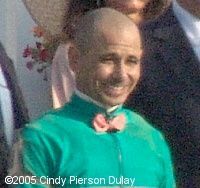 He also gave veteran jockey Mike Smith his first Derby win in 12 tries, one of which was on Holy Bull. He made their first Kentucky Derby start a winning one for both his owners, Mr. and Mrs. Jerome Moss, and his trainer, John Shirreffs. Although he followed a popular prep path to the Derby, he came into the Derby with only one win to his credit in a maiden race last October at Santa Anita. 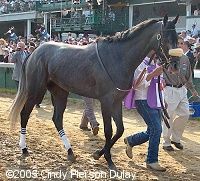 He made his first start of 2005 in the Sham Stakes where he was third, 1 1/4 lengths behind Going Wild. 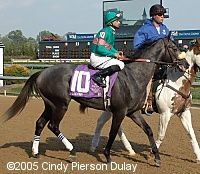 His next race was the San Felipe where he was second by 6 1/2 lengths to Consolidator, and his final prep was a fourth place finish, 2 lengths behind Buzzards Bay. While these were not bad races, they certainly didn't indicate a horse who was ready to win the Kentucky Derby. Giacomo is owned and was bred by Mr. and Mrs. Jerome Moss. They live in Los Angeles and have been active in Thoroughbred racing and breeding for many years. Moss is the co-founder of A & M racords along with partner Herb Alpert of the Tijuana Brass. They sold A & M to Polygram in 1990 but Moss remains active in the music business today. This is shown by the fact that Giacomo is named after recording artist Sting's 9-year-old son. After the race, Mr. Moss said, "This is about as up there as you can get. It was hit records that got me here but this is a pretty great thing. I mean, I guess very few people experience what we've experienced, to win the Kentucky Derby is everything anybody ever wants to do." Trainer John Shirreffs has been around horses all his life. He began training in 1978 in Northern California and has been an assistant to Brian Mayberry and Bill Spawr in Southern California. His big break came in 1994 when he became the private trainer for the 505 Farms of Ed Nahem and Marshall Naify. When 505 was dispersed after Naify's death, he trained for Thoroughbred Corp. until Price Ahmed bin Salman died and it was dissolved. Some of his big runners include Bertrando, Manistique, Swept Overboard, Starrer, and Hollywood Story. After the race, Shirreffs said, "You know, I didn't see a lot of the race. I was down on the track level so I didn't see too much, but the fractions were very fast and he was a little wide around the first turn. So I didn't really pick him up until maybe about the 3/16ths pole and I saw the white shadow and said, well, he's moving and Mike got him to the outside and he just started gobbling up the ground and I thought, wow, we have a chance to hit the board, and, oh, no, we might even win it! So it was awesome." Jockey Mike Smith has been riding since he was 11 years old where he rode at bush tracks in New Mexico. He got his license at age 16 in 1982 and won his first race that same year. He wound up in New York in 1989 and stayed there until moving to Southern California in 2001. 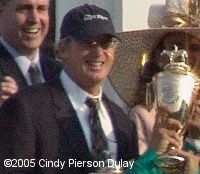 This was his first Kentucky Derby win in 12 tries, but he had already won the Preakness (1993 with Prairie Bayou) and has 10 Breeders' Cup victories to his credit. 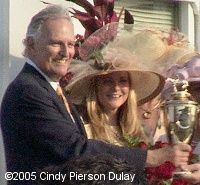 He won the Eclipse Award for outstanding jockey in 1993 and 1994 and was inducted into the Racing Hall of Fame in 2003. 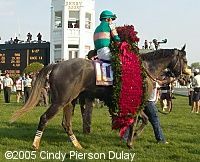 He has ridden such greats at Azeri, Skip Away, Holy Bull, and Lure. He was also the first US based jockey to win a European Classic, the Irish Two Thousand Guineas in 1991 with Fourstars Allstar. After the race, Smith said, "It's just an incredible feeling, it was exciting and my legs buckled and just hanging on for dear life really. Ive been so fortunate to have won some great races but never have I had a win like this, this is unreal."